Captain America: Civil War came into our lives this summer and it focused on the conflict in the MCU between Tony Stark and Steve Rogers. While the movie boasted an impressive amount of heroes fighting each other, some Avengers were missing. But this was well known, as the end of Age of Ultron saw both Thor and the Hulk leaving the Avengers, at least temporarily. The Hulk had absconded on a Quinjet after the fight in Sokovia, and Thor had returned to Asgard after his vision of the Infinity Stones led him to want to learn more. However, Marvel released a video at comic con of what Thor was up to during that tumultuous time that will be a part of the special features of the blu-ray, which will release on September 13. It appears to be that Thor didn’t go home, at least in the traditional sense. 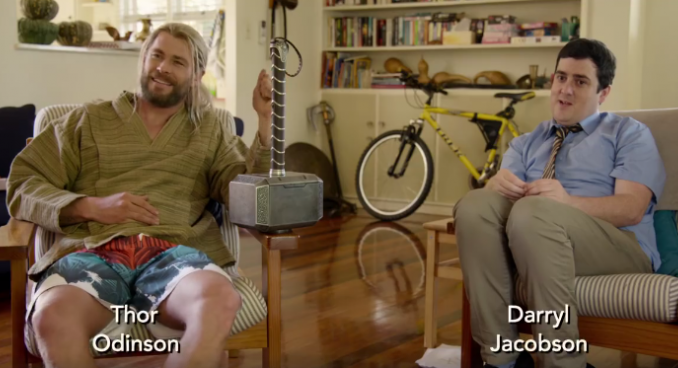 It’s revealed that Thor went to live in Australia to take a break from being an Avenger. He’s living in a flat with a roommate, a man named Darryl Jacobson. The video has some great comedic moments, like when his roommate is attempting to clean the floor, but Mjolnir is in his way. He heads to Darryl’s workplace, and Darryl writes emails to both Tony and Steve, seemingly to lend his help to a side. Later in the video, he’s at a cafe with Bruce Banner (who can’t understand why he keeps waking up in cut-offs). During this lunch date, Bruce gets a call from Tony, and Thor asks to speak with him. Bruce offers, but then states “oh, you’re busy?” and tells Tony to call Thor. Thor being who is he is, states he doesn’t have a phone and suggests a more archaic form of contact: a raven. The video ends with a slightly disappointed Thor stating that he doesn’t need to be a part of any team except Team Thor, which includes himself and “D” Check the video out and tell what you think!